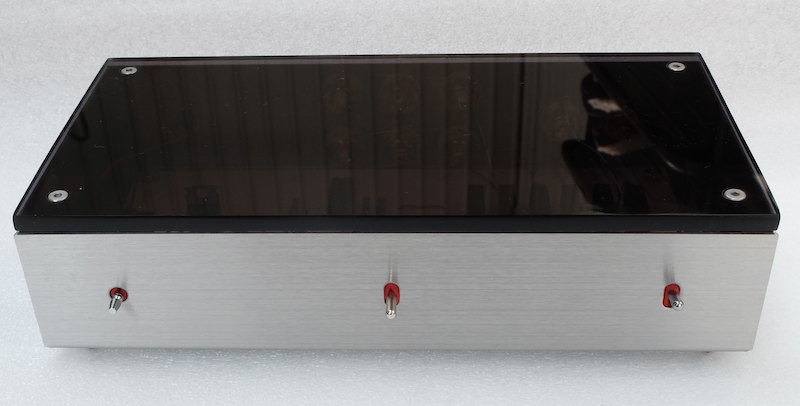 Sparkler Audio | Products | model S506 "switchgirl"
When used in combination with a power amplifier model S505, with this input selector, you can switch three music sources. You can purchase it separately so that it can be used even in combination with other systems. Besides conventional voltage-mode signaling type, current-mode type can be selected. Smart Size ― Easy to wiring from rear panel. 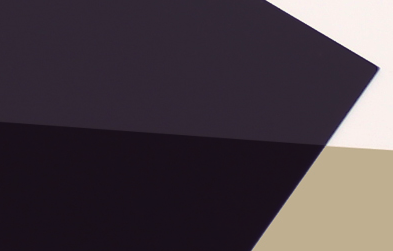 In size-held (100×200mm) in one hand, you do not choose a place to put it. Since the depth is narrow, it does not get in the way routing of the wiring from the rear panel. Monotone Finish ― We strictly enforced basic performance. The "switchgirl" means telephone exchange lady at an old time, the top plate in 5mm thick acrylic, this model has gray-smoke monotone panel only. 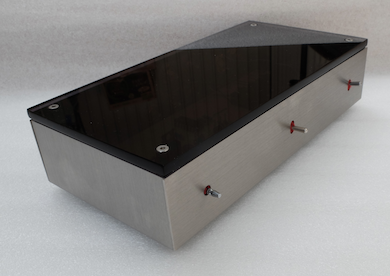 Simple Front Panel ― Easy to operate. We designed as soon as possible to immerse into the music by losing cumbersome switches as much as possible, just plugging in the cable and turning on the power. 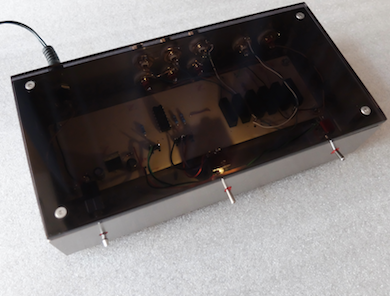 The operation switches are input selector and mute/play only. No Habit Sound Quality ― Thoroughly eliminate the element that causes the stagnation of the music signal. We deeply considered and serveyed about elements that cause a stagnation of the music signal. 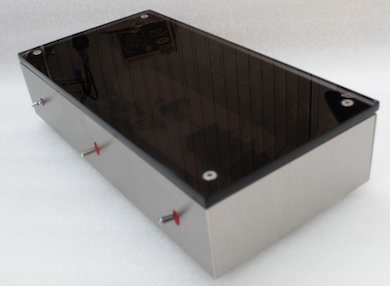 As a major factor, "bold and clumsy" connectors and terminals with too much conductor, metal plated wires, excessive amount of solder and so on. These by thoroughly eliminated, balanced of frequency range, there is no hysterical distorted voice with a feeling of a high-frequency range and electronic equipment smell incidental sound of habit, finished in a natural unprecedented "elegant" and "refined" sound quality. S506i has voltage- to current-mode converter for conventional device. Ruthenium contact ― Long life, high reliability reed switch is used. 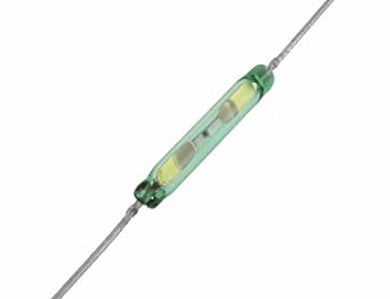 In switching signal systems, adopting a long life, high reliability reed switch (contact: ruthenium) in which an inert gas is sealed in the glass tube, the deterioration of freshness is very low. 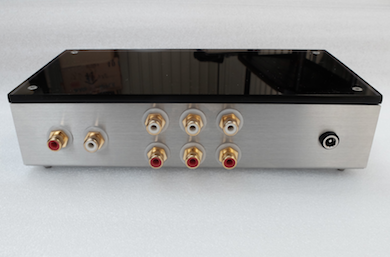 It is a high purity input selector which is almost indistinguishable from the direct connection without any inclusion between the music source and the power amplifier. This model has gray-smoke top panel only. Copyright © by Sparkler Audio Inc. All Rights Reserved.